This comprehensive tour of western and central Turkey covers most places a visitor would want to see. Starting in that world city situated on two continents, Istanbul was until May 1453 Constantinople, the capital of East Rome for a thousand years. From here travel down into Minor Asia with its historical places going back to Greek antiquity. 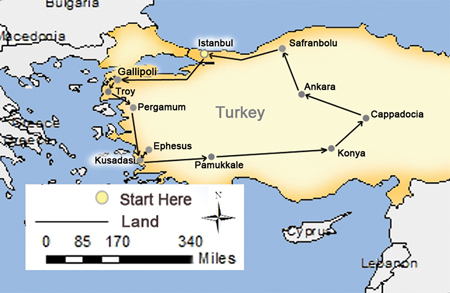 Return by way of the southern Turkish coast and central Turkey with its capital Ankara to Istanbul. Upon your arrival, you will be met by our representative before transfer to your hotel. Spend the remainder of the day at leisure.